This log viewer also supports 2015, 2016, 2017 and 2018. This version has been "Signed" by Acronis. The 'Log Type' Menu allows the user the select the different log types to view. The 'Source Folder' Menu allows the user to navigate to other folder to view saved or moved log files. Which brings up a sub Menu to select the Launch Mode the user wants. 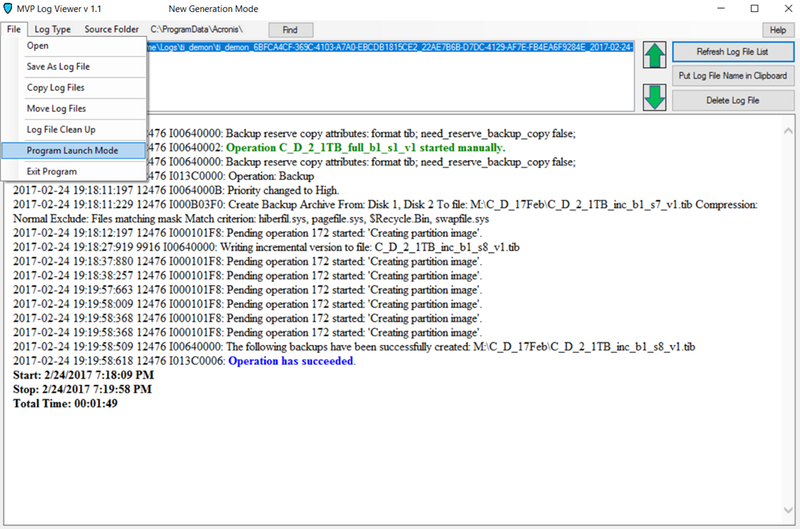 Version 1.20 improves the log file cleanup capability by adding an exclusion list. 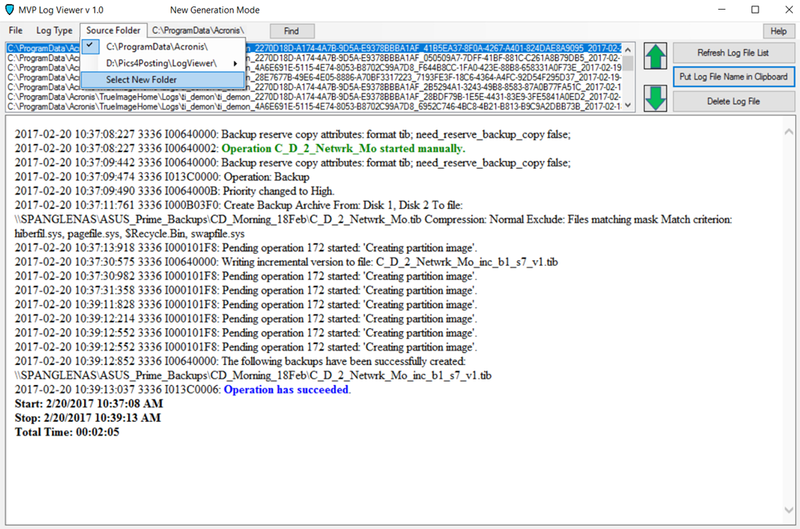 Log File Types in the exclusion list will not be displayed or deleted when using log file cleanup. 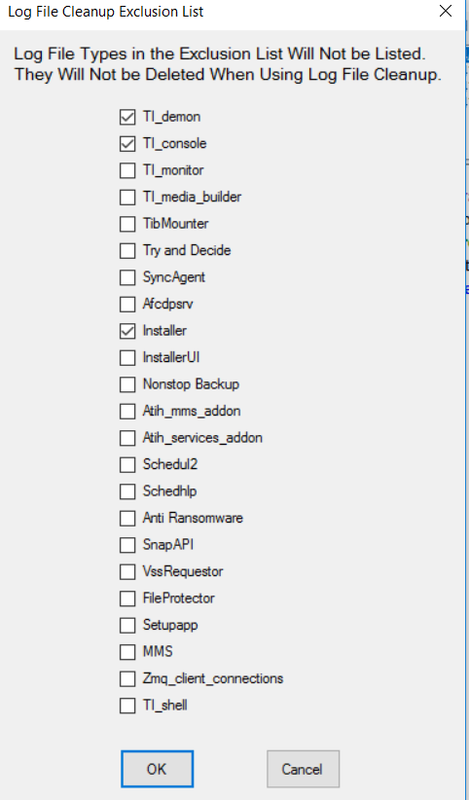 My personal preference is to exclude the installer log file, and the ti_demon (service) log files. I review all ti_demon (service) log files, then delete them separately, if there are no errors or unusual occurrences. Version 1.20 includes a program checksum capability. This ensures that the program is downloaded and unzipped without corruption. It also minimizes the chances of malware attacks on the program. The first time version 1.2 is run, it will download a small checksum file from the Acronis blog website. It compares the downloaded checksum against the calculated checksum of the .exe file. If they are identical, it writes the checksum to the hard drive. Depending on your internet connection, this may take several seconds. I have added a 'Splash Screen' to indicate the program has launched. Subsequent launches will use the checksum on the hard drive to validate the .exe checksum. So, the program will launch quicker. If the checksum does not validate, the program will issue a warning message recommending to end the program and download again. If the computer is not connected to the internet, the program will run normally. Thanks Randy for all the work you have put into producing this very useful tool. I second that. I was one of those doing pre-release testing and it does everything I need to do. For those running 2017 NG with malware protection active, you may get a message when running log cleanup that a file cannot be deleted. In my experience adding the MPV Log Viewer to the white list does not in my testing overcome this behaviour. I suspect may be a good thing that this happens. Works well for me. Greatly appreciated!!! I saved the zip on my desktop, and unzipped it to the desktop. I right click, run as administrator. I get the UAC dialog, click yes and nothing happens. It is not shown in task manager. Does it need to be in a particular folder? OK it did finally open! I'll probably have more questions later tho'! Smart Screen Filter may be blocking it - did any other messages appear? It should run from anywhere as a portable app. FTRPilot should be able to help you out if theres an issue. Any chance you have NG with protection enabled? If so, make sure to whitelist the file since it needs to "access" Acronis log files, which could be flagging in NG as a threat. OK a question, does the clean-up option work only on the filetype selected? I ran it with the default, set it to delete any over 60days old and it only removed 564 files. There are 4,497,774 files going back to 7-5-2014. Most if not all are *.log files. I get only as much as 5 or 6 files in the viewer for any type I choose. I only have NG logs on my system. If you upgraded from the standard version to NG (not sure if you did or not), you may have older "standard" logs and the newer "NG" lgos. If you have old logs, try switching to the old log viewer mode in the menu and then running cleanup again. File >>> Program Launch mode. 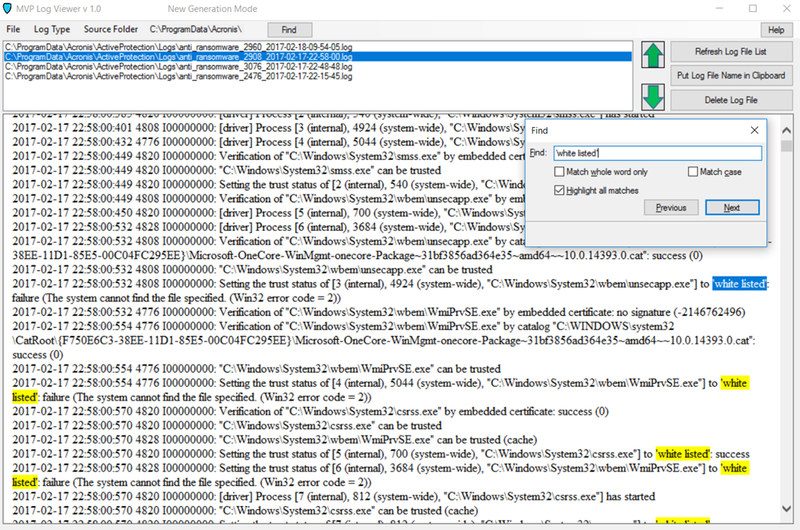 Also, launch the logviewer by right clicking and "run as administrator". It will open, even if you don't, but may not have rights to cleanup up files if launched without the "run as admin" option. If logs are in use, they may not cleanup either. OK, NG is just on 2017 isn't it? I forgot to say that I'm using 2016, although there may have been some logs left when I tried 2017 a week or so ago. After that I used the Acronis Cleanup tool to remove the program (but it apparently didn't remove any log files) then I re-installed 2016 and haven't moved up to 2017 yet. I didn't think about the old mode, I just set it for New Generation as shown abouve without thinking what that was! So Thanks, I'll try that! Yes, NG is just for 2017. It should default to the version of Acronis installed, but it's possible that it still thinks NG is the default if tidbits were left over from when 2017 was previously installed. I recently found that the cleanup too, despite using the same KB article, is being updated as well. If you need to run cleanup down the road, be sure to download the cleanup tool at that time - chances are it will be newer and support the more current versions. OK, Thanks! Although in this case it seems that the log files it missed are from the old versions, and I'm thinking that while a large number of them were created by 2016, the files were of a type that came befor that. I think that, because looking at all the files created in the last 60 days, the filenames changed on Feb 9th. I think that's when I did the failed install of 2017 and went back to 2016 doing a clean install. The old filenames are almost all hexadecimal (i.e. : F41BC5E7-559A-4293-998B-5CB177181BDB.log). while the new ones are also, but they have a prefix (such as console-67F6F7F8-D484-4252-BA0B-7187E1517A36.log) or a date with a prefix (like: service_2017-02-28-06-00-01.log). There were a few from 2014 that were like: Saturday_July_05_2014_5_06_13_PM.log. Since Feb 9 there are only maybe 8-10 files created each day. Before that there were as many as 84,000 created in a day! That's just crazy if you ask me! :) Also because the files are around 500 bytes each, 1.6GB of files are using 16 GB of disk space. 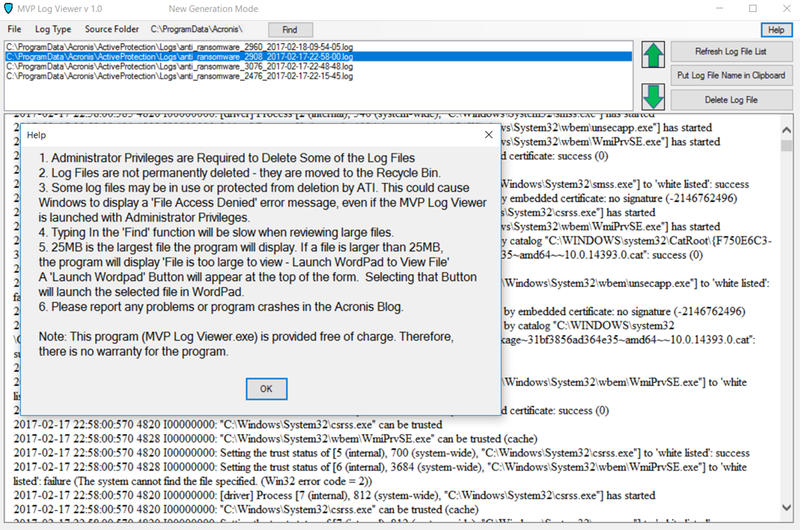 And I did run the log cleanup in MVP Log Viewer after switching to Legacy mode and it deleted only2485 files that were more than 69 days old. Anyway it seems that the only thing to do now is delete a few thousand files at a time manuall which I've been doing Then when I un-install 2016, I'll do a though search for anything left behind before I put in 2017. In Explorer, navigate to C:\ProgramData\Acronis\TrueImageHome\Scripts and save the .TIS files you find there - these contain the configuration data for your backup tasks and can be restored later after installing 2017. Now uninstall 2016 normally via the Control Panel, then download the Acronis Cleanup Tool (link in my signature) and run this as Administrator followed by doing a restart of the computer. Check in Explorer that the C:\ProgramData\Acronis path no longer is present - if it is, then delete the Acronis folder and all subfolders. Finally do a clean new install of ATIH 2017 latest build (download from your Acronis account if needed), then restore your .TIS files to the Scripts folder. You will need to edit your backup tasks to set any schedule settings. OK, cool! I didn't know about the .tis files. Receive debug information on Log Type: TI_shell: Unhandled exception has occurred in your application. If you click Continue, the application will ignore this error and attempt to continue. If you click Quit, the application will close immediately. This there a fix/workaround for this error? Alan, it may be best if you drop a PM to FtrPilot with as much detail about this unhandled exception as possible so that he can check his code for the Log Viewer app. What size is your ti_shell.log file? That may be a part of the issue if it is very large or has a large volume of entries. Can you open it in Notepad? Also please ensure that you are using version 1.11 not an earlier version. Thanks for the reply Steve. Does this shed any light on the debug message? 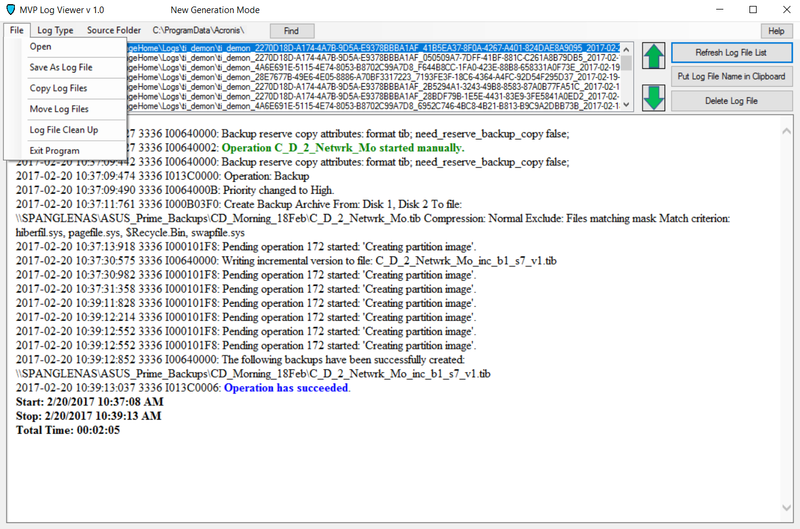 Alan, the MVP Log Viewer only looks at the log files found from C:\ProgramData\Acronis\ so the other ti_shell.log file you found in the temporary internet folder path would not be included or involved. FtrPilot should be due to release a new version 1.2 for the Log Viewer soon so be worth waiting to try that when it is announced here. Both versions work fine on my system and my ti_shell.log is over 12,600 KB in size. Deleted the ti_shell.log file from the temporary internet folder path but the debug error remains. I'll be on the lookout for the next release. Also, the current version is 1.2...next version will be 1.3. Hi, thanks for MVP...Why did acronis make it so difficult to figure out you have an errror!! and what to do about it ! Are they ever going to fix that !! I can't find the link to the zip file, has it been deleted or am I looking over it? You can download the log viewer from 59335: Acronis True Image 2017: Community Tools. See also the MVP User Tools - Google Drive where you will find the latest versions of these MVP tools and documents etc. I'll be on the lookout for the next release. I'm confused as to which is the latest version. 1) At the top of this post it says MVP log viewer version 1.1. 2) Ekaterina's post on 6/2 has a link 59335: Acronis True Image 2017: Community Tools . It has a link the tool. to download ReadLogFileNewGen.exe. When I executed on my desktop I get a message "Acronis True Image 2017 next-generation is not installed Hit OK to Run Program or Cancel to Exit." I have TI 2017 version 8058 that is not next-generation. Hitting okay it runs and says is version 1.11. In the menu bar there is no "Find" to "Select Program Launch Mode" so I won't expect next generation. 3) Steve Smith's post also on 6/2 has a link MVP User Tools - Google Drive with a folder FtrPilots_Log_Viewer that has read_log_file_standalone_2_2.zip. It sounds newer, but the zip file called Read_Log_File.exe is dated 6/5/16. When I ran it couldn't process the log file. So I assume 2) is the latest. Thanks Steve. I downloaded then executed MVP Log Viewer.exe. I got a warning from Microsoft. Continuing, the program opens but it doesn't process the log because Acronis Active Projection opens warning of possible ransomware trying to modify my files. I granted one-time permission and then it shows the log. 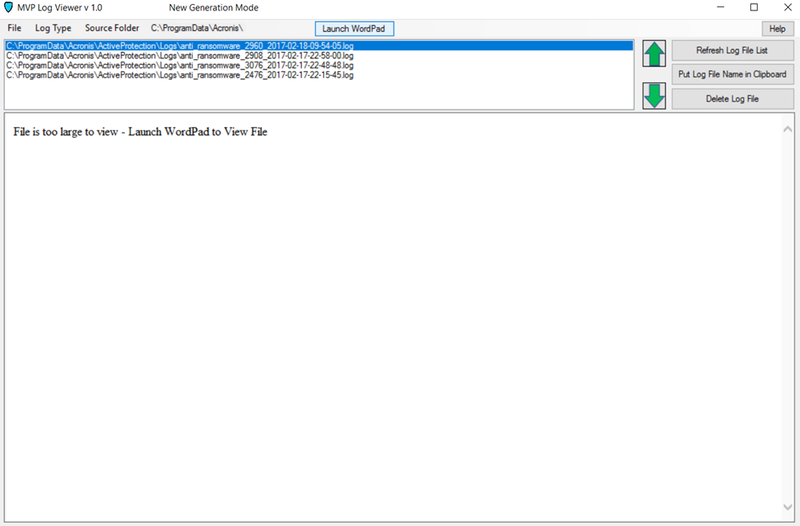 Why does it need to modify any file? Shouldn't it just be reading them? ReadLogFileNewGen.exe Version 1.11 doesn't trigger the ransomware warning. Ray, I also got a similar warning for the first time of running the Log Viewer but trusting it has not caused any problems. 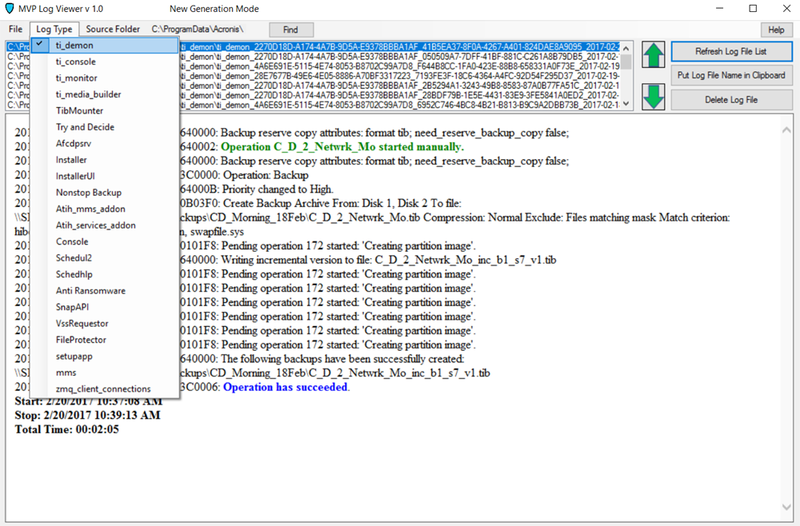 The Log Viewer does create a TrueImageLogs folder in your Documents folder when it runs, as a place where logs can be copied to etc. I don't know if this is the right place, but I'd like to make a suggestion for an improvement to the program. Different log files have different ways of representing the date and time. Some logs show date and time in the local time zone and proper format. Some logs start a line with the local time in dd.mm.yyyy format. Others will start a line with local time in yyyy-mm-dd format. Others start with UTC/GMT in YYYYMMDD format. This is really annoying when I'm trying to look at different logs to determine what may be happening at a specific time. I would like to see an option where all date and times (at least those that start a long line entry) could be normalized to local time zone, local format. Bruno, you would need to ask FtrPilot (Randy) if this would be possible as he is the author of this Log Viewer tool. I have not seen him active in the forums recently, so perhaps try sending him a PM. I can do that, Steve. But considering what we know about not being informed of PMs, he may not be aware. Steve, that Dropbox link for v1.24 gives me "That file isn’t here anymore". And I can't figure out (in the MVP Log Viewer (ATIH 2015-2017) thread) whether the most recent version is at either 59335: Acronis True Image 2017: Community Tools or MVP User Tools - Google Drive. Coyote, try MVP Log Viewer.zip as from what I can tell the other links are all for the older version of the tool! (I do not have the correct access to upload the latest v1.24 to the Google Drive folder). Note: I removed the older v1.24 Dropbox link as that was to the .exe file which would cause a potential security alert when being downloaded. All, My apologies for being away for so long. But I am back and will have some time to work this issue. I have been working on updating the log viewer to support ATI 2018 and have been working on improvements to standardize the date/time format in all of the log files. The log files are not changes, but the log viewer will display the date/time in the same manner for all log types. For example, here a line out of a monitor log. 8/13/2017 7:38:04 AM: 1908 E019203F5: Error 0x19203f5: Sync Agent service error. Try to restart your computer. So, please check back for further information. FtrPilot, glad to see you are back and working the viewer. I also wanted to make another suggestion... it would be nice to be able to specify a time range and generate a merged view of all log entries for that range. It would be very handy when problems occur to isolate the sequence of events throughout the program. Randy, welcome back - good to hear from you again! Bruno...I need a little more info on your concept of a merged view. My assumption is the merged view would be in the filename list box. The user would select the log file types to be displayed, then select a date range. Then the list box would show those log file names in chronological order. Based on my current code structure, this will not be a simple task. It is certainly doable, but won't make it into the next release. I do think it is worth pursuing. 1. Any menu item that opens a dialog box should have an ellipsis. 2. Perhaps Source Folder could go under the File menu with the name of the folder displayed using a status bar at the bottom of the window. 3. Perhaps a Tool menu, with the Find function under that. 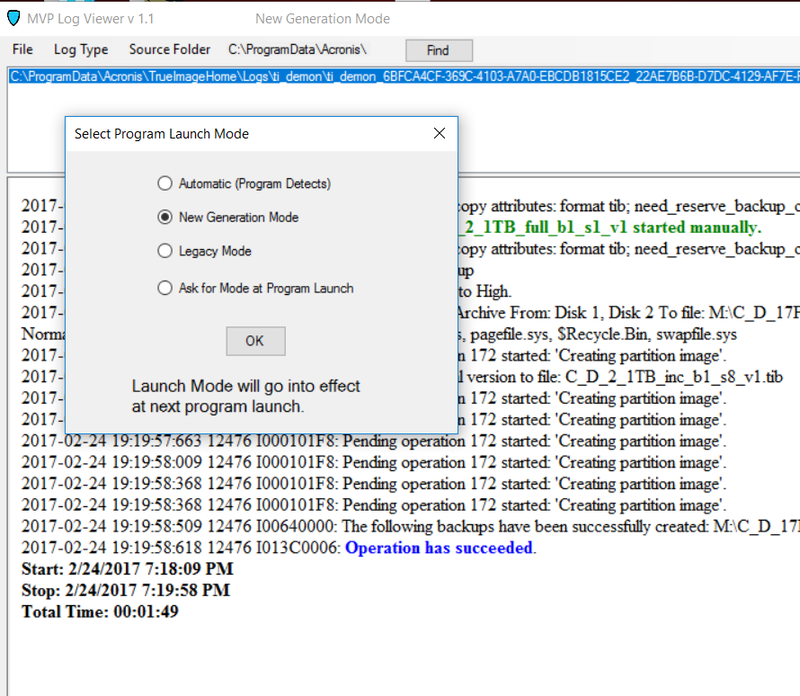 Under the Tool menu could be a new Generate Merge... command which would bring up a box to select which logs (or all logs) and a date and time range. To create the resultant window, go through each requested log and find all entries within the range. And then, sort the entries by time so what you see are specific log entries for all the logs intermixed but merged together in time sequence. Each entry would need to specify which log. One possibility initially may be to simply create a .csv file where each entry would contain log name, date/time and logged entry. It could be loaded into Excel and sorted. I know nothing about your current code structure so I have no idea what would be involved. I do know that I have often bounced around different log files to try to find what is happening at a specific time around an error. And that has been a frustrating process. But don't let me sound negative... I really appreciate this tool! Bruno...comments and suggestions for improvement & new features are always welcome. I believe merging the files as you describe above would be easier than merging the file list box. If you could manually create a .csv file showing your concept, then that would help a lot. The .csv file doesn't have to be long...maybe 4 or 5 lines. Also, menu suggestions, like you made above, help immensely. I have read your latest PM to me and will respond shortly. To anyone else following this thread. If you have any suggestions for improving the Log File Reader or added capabilities, now is the time to provide them. I've just noticed something odd. When I run the new log viewer I get a set of Acronis logs in my Recycle bin. If I run the viewer again I get another set of the same logs in the Recycle bin. I now have 3 copies. The log names are the same - e.g. ti_monitor.0 - but the sizes increase. Does the log viewer delete these files but ATI rebuilds them ... with additional records as time passes? What would happen If I tried restoring one of the logs? Patrick, Randy is currently travelling in the UK so may not get round to replying to your post above, however, looking at the same behaviour on my own system, these deleted log files are not from the actual logs folders, but are temporary copies that the tool creates then deletes as part of its processing. Mine all show as being from C:\Users\Smiths\Documents\TrueImageLogs\Temp folder whereas the original logs would be found in the C:\ProgramData\Acronis path. The Log Viewer is written in Vb.net. One of the limitations in Vb.net is that it cannot open a file that is open by another program. 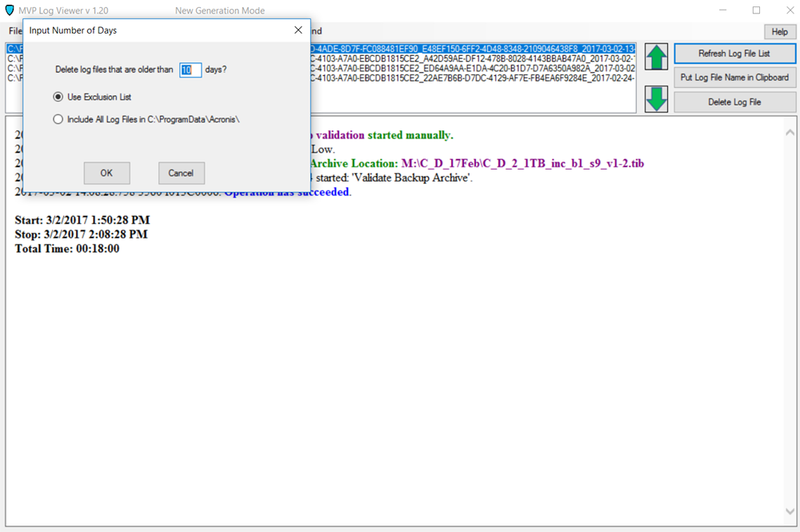 So, to get around this limitation, if True Image has a file open, the Log Viewer copies the file to the C:\Users\UserName\Documents\TrueImageLogs\Temp, opens the file, then sends the copied file to the Recycle bin. Since it is a temp file, I could code the program to permanently delete the temp (copied) file instead of sending it to the Recycle bin. I managed to no post my response to Steve's comment. It said, in essence, if I'd been alert enough to look at the file's path I would never have posted my comment. I suspect we can all cope with the deletion of temporary files in the Documents folder. If you have nothing better to do you might consider permanently deleting them, but I'd give that a pretty low priority if I were you.